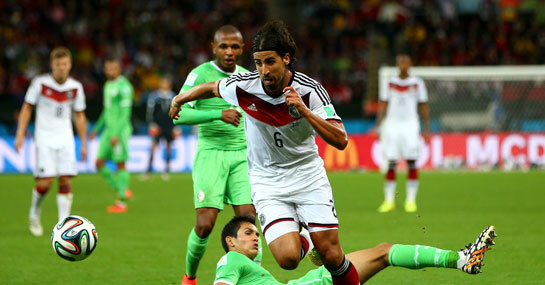 Sami Khedira isn’t fully fit for Germany at this World Cup, forcing Joachim Low to use him sparingly over the course of the tournament so far. The Real Madrid man, not long recovered from a six-month cruciate ligament injury, started the first two games in Brazil – getting replaced by Bayern Munich’s Bastian Schweinsteiger after 70 minutes against Ghana. He’s since taken his place on the substitutes bench for the next two matches, only being required again with 20 minutes remaining of Germany’s round-of-16 clash with Algeria. While his exposure hasn’t been as full as he’d have liked, Khedira is still attracting Premier League attention with his performances, as Arsene Wenger looks to add yet more Die Mannschaft representatives to his Arsenal squad. Should the Frenchman be successful with his reported £23m bid for Khedira, it could potentially be the move that solves many of the FA Cup winner’s problems at the Emirates. Firstly, the options Wenger has to partner Aaron Ramsey in central midfield are both the wrong side of 30 in Mathieu Flamini and Mikel Arteta. While Khedira, a 27-year-old, would be an improvement in that department he’s also the sum of those two’s parts as he can pass the ball as capably as Arteta while mixing it defensively like Flamini. But, perhaps more importantly, Khedira’s north London arrival would allow the Gunners to see the best of Mesut Ozil on a far more consistent basis. Khedira’s ability on the ball would release some of the creative pressure on Ozil, while the pair’s partnership at Real Madrid saw Los Blancos claim the La Liga title in 2012, something that Arsenal fans hope the two could recreate (at odds of 8/1) in the Premier League this term. Ozil was chastised in some quarters for his lack of motivation towards the end of last term, and would surely feel happier at Arsenal with his great mate by his side.